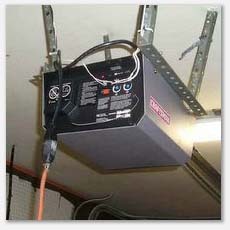 Electrical codes call for dedicated outlets for all garage door openers. Extension cords could become unplugged, overheat or fail. In addition, fire codes do not permit permanent installations of appliances on extension cords. All openers are also checked for smooth operation and working safety reverses. We found this pamphlet on garage door safety, provided by the U.S. Consumer Product Safety Commission, the National Safety Council and the Industry Coalition for Automatic Garage Door Opener Safety.